Karen Day (Aspen Free Press)/Special to the TimesPhil Sullivan readies himself for closing arguments during a recess at Tuesday's trial in Pitkin County District Court. A judge found Sullivan, a taxi driver, in contempt of court for violating a court injunction that prohibited him from collecting tips as part of his free Aspen taxi service. ASPEN – Phil Sullivan’s wild, defiant ride through the justice system is nearing an end. A district judge sided with the Colorado Public Utilities Commission on Tuesday, ruling that Aspen’s rogue, late-night taxi driver was in contempt of court for ignoring a July court injunction that forbid him from taking tips from passengers. Most recently, on Aug. 26, an undercover PUC investigator hitched a ride with Sullivan to the Aspen airport and paid him a $20 tip. That prompted the PUC to ramp up its efforts to put the brakes on Sullivan, and in September it filed a motion to find him in contempt of the July injunction. Tuesday’s trial effectively ended a long-running feud Sullivan had with the PUC dating back to 2006. Sullivan had essentially blown off a string of orders from the PUC to get off the road because he didn’t have the proper licenses to operate a taxi service. He also ignored nearly $13,000 in fines against him, instead hauling late-night partiers and service workers to their destination in his white KIA mini-van, which he typically stationed in front of Bentley’s at the Wheeler after 9 p.m.
As the PUC’s scrutiny intensified, Sullivan, who founded the Mellow Yellow taxi service in 1974, held his ground, maintaining he did not charge people for rides and did not run a taxi business. Instead, he had claimed, he simply provided a complimentary shuttle service. The PUC, however, said Sullivan was accepting tips instead of fares, making his operation a taxi business. Sullivan’s sentencing is set for 1 p.m. Tuesday, March 1. While he was found guilty of a civil charge, he still faces up to six months in county jail. Judge Nichols said he’s in line for a “short jail sentence,” but that also depends on whether he shuts down his service between now and the sentencing date. Outside the courtroom, Sullivan said he hadn’t made up his mind about what he’ll do. But inside the courtroom, he said any jail time would send a bad message. “If Phil Sullivan goes to jail for giving free rides and Charlie Sheen gets out for threatening his wife … throwing a man in jail for free rides will be an embarrassment to Aspen,” Sullivan said during closing arguments. He added that most workers in Aspen take tips in some form or fashion. “There’s nobody in Aspen that is allergic and won’t accept gratuities – lawyers, judges, well, maybe not judges,” he said. His emotional, rambling plea drew a applause and laughter from those in attendance, who ranged from Sullivan’s longtime friends to competing taxi drivers who felt Sullivan had been exploiting the system while they followed the rules. 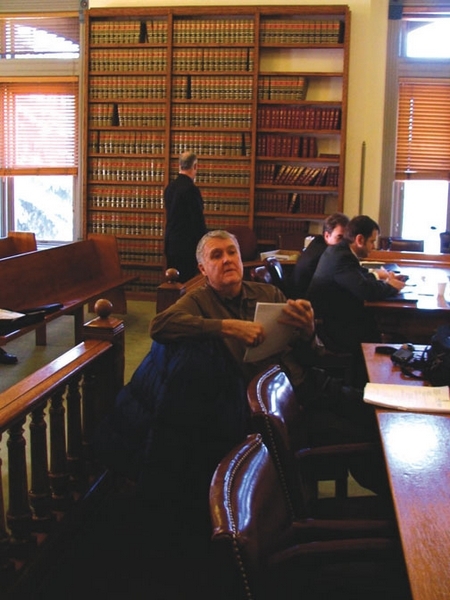 It was a classic David vs. Goliath trial: The PUC came armed with four representatives wearing dark suits and shined footwear, while the blood-shot Sullivan was tie-less and sported jogging shoes. Sullivan didn’t have a lawyer and represented himself, and called two of his passengers to the stand, who testified they tipped him but never paid a fare. Oftentimes Nichols gently guided Sullivan through the trial process – many of his questions were deemed irrelevant, and he unsuccessfully tried to employ hearsay evidence. The PUC was represented by assistant attorney generals Emanuel Cocian and Kevin Opp, who used a more traditional, lawyerly approach. “We’re a nation of laws and we abide by the laws, and if we don’t do it, there are consequences,” Opp said in closing arguments. Sullivan, meanwhile, said he once had more than $2 million, but because of bad investments his nest egg had dwindled to $5,000, prompting him to hit the streets with his taxi service. Equally as valuable to him, he said, was the interaction he had with his passengers.